First he put it up for lease it for the 2014 summer season at a rate of $150,000. 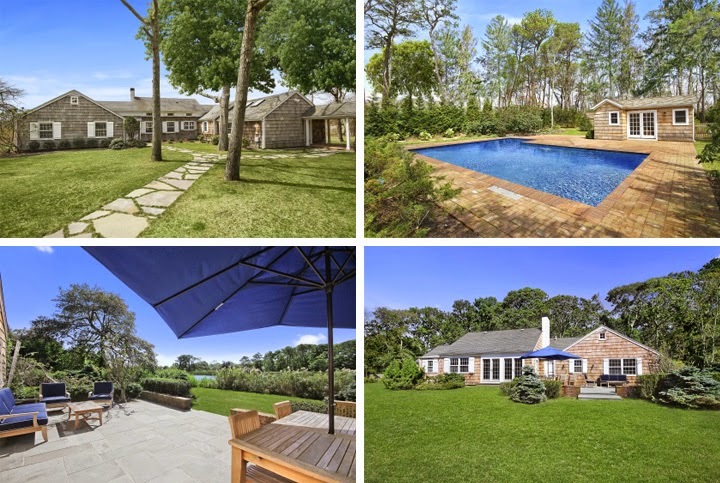 We don't know if there were any takers but now, as the busy real estate beavers at Curbed revealed, CNN silver fox Anderson Cooper listed one of his two, multi-acre creek front properties in the little lauded Hamptons community of Quiogue (NY) up for sale with an asking price of $2.999. Mister Cooper acquired the five bedroom and 5.5 bathroom shingled ranch-cottage on 2.4 acres in late 2011 for $1.7 million. The seller was the widow of Oscar-winning screenwriter Budd Schulberg who wrote the iconic 1954 film On the Waterfront starring Marlon Brando. Mama your so funny...AC is probably cancelling the listing right now because you put that thought into Kathy Griffins head. I read recently that he did not expect to inherit a dime from Mama (Vanderbilt) but perhaps he did and just tossed that out there, and Mama V said "thats correct my little girl"..hence the property is for sale.. I never understand why people of means sell off their peace and privacy (if they do not have to). I am so buying lottery tickets tonight and first purchase would be this house! Hi Andy! Probably because he bought it to flip. He bought it cheap - did some renovations and is flipping for a $1m profit. He has his place next door that is on several acres of peace and privacy. This was a project for him to play with. 12:50 Dear..Play with? He has that British Morgan guy for that. 1M profit? Please do the math. Capital gains, renovation, transaction fees ..if he walks with half of that figure he will be lucky. Its nothing to sneeze at, but hardly worth his time and risking Ms. Griffin next door, as our beloved Mama pointed out. Ms. Griffin has graduated to A-Lister. And to add: Mama, you have the best site on the net! I love reading your posts and you are full of information for us children. XOXO. KG posted photos of herself licking AC’s ear to her Facebook last week. I saw her live just a couple of weeks ago, but can’t recall just what she said about AC and Gloria, who she’s gotten to know well over the years and likes. And Gloria does not have anything remotely like the wealth that’s being attributed to her.